Renovated luxurious chalet. Comfortable with sauna, turkish bath as well as a leather lounge and open fire place. 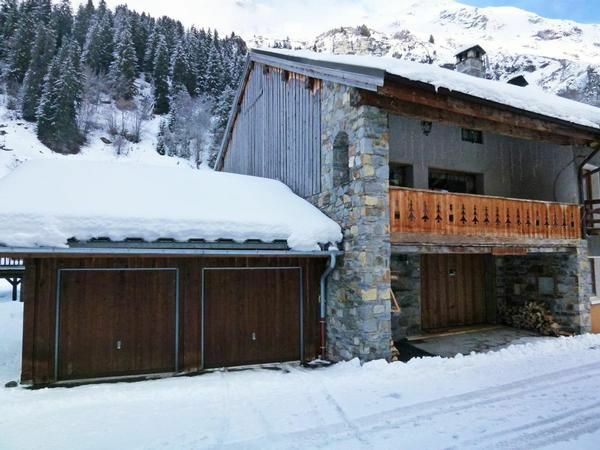 Situated in Champagny le Haut, a very calm hamlet, midst of a picturesque landscape. The "national parc Vanoise" is nearby. Restaurant at ~300m. To the center of Champagny as well as to the cable car 5 km. Altitude chalet: 1.500 m, ski area up to 3.250 m, with two glaciers. Champagny is part of the enormous ParadiSki area (La Plagne and Les Arcs) with 425 km of alpine slopes, 157 lifts and is connected to the Bellecôte Glacier and Les Arcs through modern express-chairlifts. Furthermore, two ski lifts connect the ski area with La Plagne (Plagne centre) via the Verdons peak. The ski run to the valley is artificially snowed. Definitely a highlight is the 10 km long ski run from the glacier “Roche de Mio” to the village with more than 1.500 m of difference in altitude. Deep powder snow runs at the Verdons peak. Children ski lift (free of charge) and ski school area at the mountain station of the cable car (2000 m above sea level). Next to the mountain station is the modern “Pic-Nic-Chalet” with sun terrace. New Highlight: The Paradiski-Skipass valid for more than 5 days includes one day in the 3Vallées Ski area (within the validity period, conditions apply); Courchevel / 3 Vallées approx. 15 min by car. There is a wide range of sports activities to experience during the summer in Champagny including cycling, mountain biking, climbing, swimming, tennis, golf as well as horse riding or fishing. In high summer your children will enjoy a visit to the adventure course and the open air pool. Highlight of your vacation will be the Vanoise National Park with nearly 500 km marked hiking trails. Different walks with alpine flora and fauna are offered. Reduced additional costs in summer: 9 € per person/week (from 5 years) for electricity + heating + sauna + jacuzzi. - Final cleaning: once per object Costs amounting to 220 EUR (optional). - baby chair: per object and day included in price . - Visitor's tax: per person and day Costs amounting to 1.65 EUR (Mandatory). - Bed linen: per person and week for rent at a price of 16 EUR (optional). - Towels: per person and week for rent at a price of 6 EUR (optional). - General: per person and week Costs amounting to 16 EUR (Mandatory). Bed linen (per person and week, according to consumption 16 EUR). Cot (per property and day, included in price 0 EUR). Final cleaning (once per object, Costs amounting to 200 EUR). Towels (per person and week, according to consumption 6 EUR).